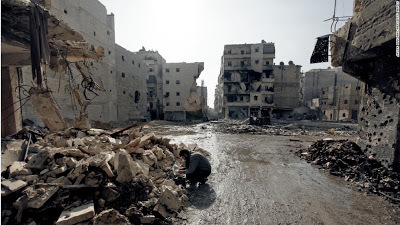 About 150,000 Christians are living in fear in western Syria, in a valley that has been subjected to steady artillery fire by Islamic rebels, the Fides news service reports. The rebels have been shelling Syrian government forces, which have built barricades in the villages of the Wadi al Nasara, a traditionally Christian region. Families in the 40 villages of the valley—where the population has been increased by the arrival of Christian refugees from Homs and other cities—have seen their homes destroyed by the gunfire, and at least 12 people have been killed. The Christian residents of the valley, who are mostly Greek Orthodox, emphasize that they are neutral in the Syrian civil war. They have asked rebels to respect their neutrality, and avoid civilian casualties—requests that, to date, have gone unheeded.